History: Canasta originated in Uruguay, was refined and expanded in Argentina, and reached the United States in 1949, where it soon became the biggest fad in the history of card games. Today, although the game has lost much of it's luster, it remains a very popular game among social players. Number of Players: Canasta may be played by any number from two to six, though it's best with four players, played as a partnership game. That's the game described here; Canasta For Two, Canasta For Three, Canasta For Five, and Canasta For Six. Number of Cards: 108 cards - two standard 52-card decks, plus 4 jokers. All cards are shuffled together as a single large deck. Jokers and deuces (twos) are wild. Determining Partners: Partners are usually chosen by drawing cards, with the holders of the two highest cards paired against the holders of the two lowest cards (deuces are low, jokers are invalid - anyone drawing a joker must draw another card. The holder of the highest card gets to choose his seat. Partners are arranged on opposite sides of the table. The player drawing the highest card also gets to play first, so the player at his immediate right becomes the first dealer. Deals then rotate to the left. Dealing: The dealer distributes the cards, one at a time, face down, clockwise beginning with the player on his left. Each player receives eleven cards. The next card, called the upcard, is placed face-up in the center of the table to begin the discard pile (or pack). The remainder of the deck if placed face-down next to the upcard, and forms the stock. Object of the Game: The main objective of the game is score as many points as possible by melding. Going out (playing the last card in your hand, whether my melding or discarding) is a lesser objective. Gameplay: Each player's turn begins by drawing a card, either the upcard (the top of the discard pile, or the top card of the stock. The player can then meld if he can and if he wishes to (you're not required to meld). The player's turn ends by discarding one card, placed face-up on the discard pile. If the player goes out, a discard is not required. Melding: A meld consists of three or more cards of a single rank (5-5-5, for example). Sequences ("runs" or "straights") are not valid melds in the game of Canasta. A meld must contain at least two natural cards, and not more than three wild cards. For example, a 5-5-2 is a valid meld (remember that deuces are wild), as is a 5-5-2-2-Joker. However, 5-2-2 is not a valid meld, not is 5-5-2-2-2-2 - in the first case because there is only one natural card, and in the second because there are more than three wild cards. A set consisting of only wildcards is not a valid meld (2-2-2, for example). A side may not have more than one meld of the same rank. Threespots (threes) may not be melded, except that a set of three or four black threes may be melded in the turn in which he goes out. Otherwise, black threes may not be melded. In addition, if a black three is discarded, the next player must draw from the stock, and cannot take the black three (this is referred to as a stop card). Red threes are bonus cards, and are not meldable at all. If a player is dealt a red three, when it's his turn he must place it face-down on the table and draw a replacement from the stock. If a player draws a red three, it works exactly the same - lay it down and draw another. If a player gets a red three as part of the discard pile, he simply lays it down, but does not replace it. At the end of a hand, if a side has layed down any red threes, but not layed down any melds, then the red threes will count against the side when tallying the score. 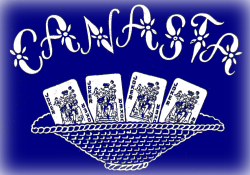 Canastas: A canasta is a meld of seven or more cards of the same rank. The canasta must contain at least seven natural cards (this is called the base). Seven or eight of a kind, with no wild cards, is called a natural canasta (or pure canasta); A set of seven or more containing of a kind, and one to three wild cards, is called a mixed canasta. For the first meld of a side, the player taking the upcard must have at least two of the same value in his hand. Further, the point value of the cards you meld (including the upcard), must meet the minimum count for that hand. You may make as many additional melds as you like, but the remainder of the cards in the discard pile do not count toward the minimum (although they may be used). If the discard pile contains a red three (this can only happen if it's the initial upcard) or a wild card, it is frozen, and to take the upcard you must match it with a natural pair from your hand. If the discard pile is not frozen, and your side has previously melded, you may take the upcard to create a new meld (if you have two or more natural cards of the same rank, or a natural plus a wildcard). You may also take the upcard to add to an existing meld. In either case, you must play it immediately, and take the remainder of the discard pile as well. You may not take the upcard if it is a black three or a wildcard. You may not take the upcard if there is only one card in the discard pile and you only have one card in your hand. Going Out: When a player plays his last card, whether as part of a meld, or as a discard, the hand is over, and the scores are tallied. A player may not go out unless his side has completed at least one canasta. If his side has not completed a canasta, he must keep at least one card in his hand. Going Out Concealed: If you go out without having melded any previous cards, either on your own or as additions to your partner's melds, and your hand contains a complete canasta, you'll earn a bonus (see table below). In addition, if you're able to go out concealed, you do not need to meet the minimum count. Asking For Permission To Go Out: A player, when it's his turn, may - either before they draw, or after drawing but before melding any cards - may seek permission from his partner to go out. The partner must answer "yes" or "no", and the player is bound by that answer. If a player does not ask permission, he may go out regardless of whether his partner approves or not. If a side has layed off any red threes, but has no melds, the points for the red threes are considered penalty, rather than bonus, points, and are deducts from that side's score. Whichever team ends up with the higher score win the hand. Each side's score is accumulated on a scoresheet (typically labeled "Us" and "Them"). The first team to score 5000 points wins the game. If the stock is exhausted before anyone has gone out, each player in turn may continue to play if he can take to upcard and immediately meld it. A player's turn ends by either going out or discarding. This continues until someone either goes out, or cannot make a play, in which case the hand ends and is scored normally (except that there is no bonus for going out). If the stock is exhausted and the last card drawn is a red three, then the game ends immediately. The player drawing the red three may lay off or meld whatever cards he can, but he may not discard. If a player draws too many cards, in subsequent turns he must discard without drawing until he has reached the correct number of cards. If a player discards without drawing, and this is noticed before the next player draws, he must take the top card of the stock. If a player, while drawing from the stock, exposes any cards, he must show them to all players and replace them in the stock. The next player may either take the top card as-is, or shuffle the stock before doing so. If a player exposes any cards from his hand, but does not meld them, he must leave them face-up on the table, and discard them one at a time in subsequent turns. However, if these cards can be validly melded before they are discarded, he may do so, rather than discard them. If a player melds fewer cards than the minimum count for his first meld, he may either add additional cards to the meld(s) until they reach the minimum count, or he may withdraw them, in which the minimum count increases by 10 points. If the opponents do not catch the error until after they've drawn, then the initial meld stands. If a player holds a red three, and has not declared it by the time the hand ends, his team is penalized 500 points.